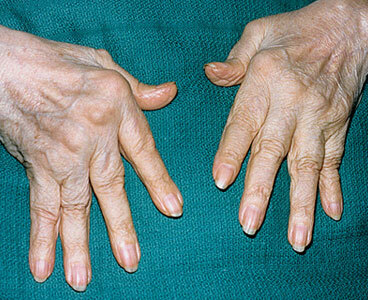 Home » Posts Tagged "Arthritis"
Rheumatoid arthritis is about the most debilitating of all arthritis, causing joints to ache and throb and eventually become deformed. Sometimes these symptoms make even the simplest activities like opening a jar or taking a walk, difficult to manage. Unlike osteoarthritis, which results from wear and tear on your joints, rheumatoid arthritis is an inflammatory condition. The exact cause is unknown, but it’s highly probable that it is caused by acid-toxic plagues. It is also believed that it is the body’s immune system attacking the synovium, which are the tissue that line your joints. Just over two million Americans are affected with rheumatoid arthritis. It generally strikes between the ages of 20 and 50 and it is two to three times more common in women than in men. Rheumatoid arthritis does also affect young children and adults older than age 50. When suffering from arthritis, a well designed exercise program can decrease the pain and stiffness you feel but also increase your range of motion. Some exercises like running and floor aerobics can increase joint pain, while others like swimming, water aerobics and biking can reduce joint pain. Exercising also has positive effects on the cartilage too because it increases the blood flow. This will bring nutrients into the joint and remove waste products. When you build strong muscle around the joints, it helps reduce the chance of injury. Each of your joints should expand to its full range of motion on a daily basis. Daily activities like housework, climbing stairs, lifting and bending do not put your joints through their full range of motion normally.